School buses are among the safest vehicles on the road. With high seat backs and egg-carton seats, buses are designed to keep passengers protected. Where applicable, it is important to ensure your bus fleet includes wheelchair transportation services that meet national securement regulations. If wheelchairs are not properly secured, they can cause harm to the student or even other passengers on board. 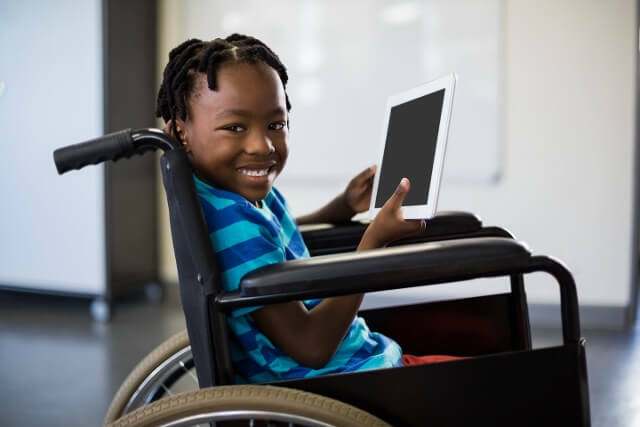 According to the National Highway Traffic Safety Administration (NHTSA), it is the responsibility of the bus driver to offer wheelchair assistance, and make sure special needs students are boarded and unboarded safely. Even though some school buses are not required to have seat belts for most riders, the regulations are different for students in wheelchairs. Many school buses are equipped with wheelchair tiedown and occupant restraint systems (WTORS). Wheelchairs that comply with ANSI/RESNA WC19 are crash-tested and approved for use as seats once the frame is secured with tiedown straps. To make sure your bus fleet is equipped with proper wheelchair transportation services, inspect each vehicle to see if a 7-point front-facing securement system is present and functional. The securement system is designed to be used with the wheelchair facing forward and is tested as such. Since January 1994, all school buses that are capable of carrying students in wheelchairs have forward-facing wheelchair securement systems. Forward-facing wheelchair securement positions are inherently safer. Sled tests show that side-facing wheelchairs become unstable and often collapse. Lap and shoulder belt restraint systems are designed to be most effective in the frontal impact position. Wheelchairs are believed to be stronger in frontal loading positions. If you can transfer handicapped students to school bus seats without compromising safety and special medical needs, you should do so. Bus seats are generally considered the safer alternative. You can still provide safe wheelchair transportation services to students who do not own or use WC19 wheelchairs. Jury rigging a securement system: Do not attempt to make your own tether system. Only use regulation wheelchair restraints to properly secure students and wheelchairs. Interchanging systems: Only use a complete restraint system. Interchanging systems from different manufacturers may result in malfunction. Blocking an emergency exit: Never block the emergency exit on a bus by securing a wheelchair in front of it. Every student has the right to a safe journey to and from school. Every school district should work to ensure their bus fleet meets the national safety standards for wheelchair transportation services. Doing so will ensure the safety of all students.